This truly charming slice of tropical paradise will have you living the waterfront lifestyle on day-one! 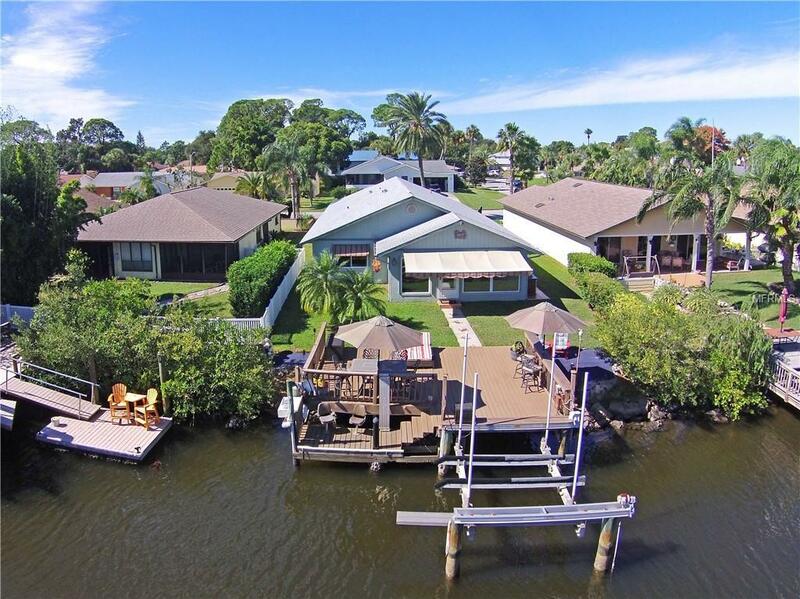 Totally renovated, turnkey & ready for you to launch endless boating adventures from the 13K lbs boat lift & multi-level composite dock w/ cleaning station, underwater lighting, shower, easy kayak launching & unobstructed gulf access! Entering this home, you'll immediately appreciate the open floor plan, tile flooring throughout & renovation craftsmanship. Entertain envious guests from the gourmet Kitchen featuring solid maple cabinets w/ quartz counters & marble back splash, quality stainless steel appliances, walk-in pantry, desk station & gracious breakfast bar all flowing into the Living Room boasting crown molding & waterfront views! The large Master Suite also provides a wonderful water view & large cedar-lined walk-in closet. The brilliant Master Bath is your own private spa offering dbl vanity w/ glass-top sinks & waterfall faucets, Champagne spa tub, amazing shower w/ Jacuzzi jet/rain system & additional closet space! The split plan provides privacy for the two gracious Guest Bedrooms offering ample closet space & served by a full Guest Bathroom. Abundant natural light bathes the Florida Room where the panoramic water view flows out to the meticulously landscaped backyard includes large grilling station & custom lighting! Many upgrades include complete house replumbing, high efficiency windows & sliders, hurricane shutters, and much more - ask for amenity list! Experience the video tour!